Endowed by our Creator asserts that our constitutional rights are not merely political but are gifts from God, and that we have a responsibility to exercise stewardship to preserve them. It is particularly important for Christians to promote a political environment which allows them to carry out the Great Commission, be salt and light in society, experience religious freedom, and be personally obedient to God. The author maintains that a Christian worldview as presented in the scriptures is the most important consideration in defining the proper role of government – one which provides for life on earth being lived most closely to the way God intended, and which permits individuals to follow God’s will. Such a “worldview” has ramifications for all political issues, many of which are discussed in Endowed by our Creator. The author also presents a Christian perspective on “The Religious Right”, “The Religious Left”, the courts, globalism, the Afghan and Iraq wars, “The Global War on Terror”, and the role of conspiracy in political developments. 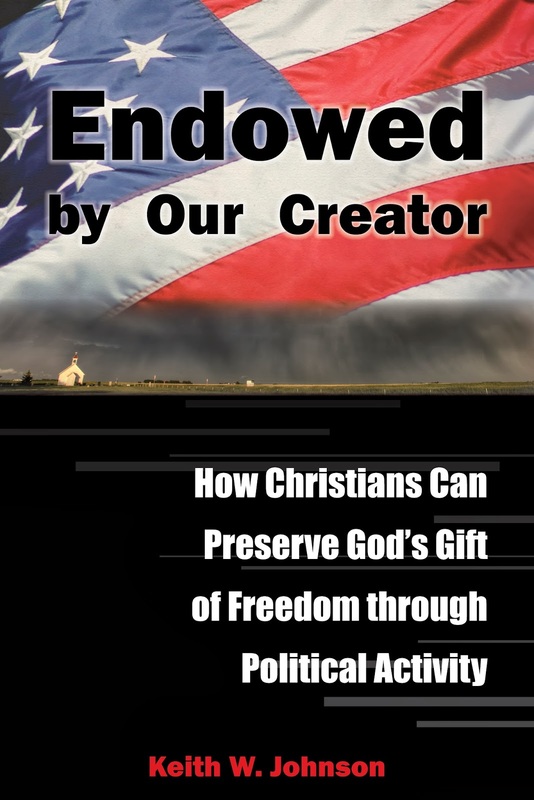 Written from a Christian worldview with Biblical references to parallel political topics, “Endowed by Our Creator” is a very interesting easy read and presents a personal challenge to the reader to take freedom, voting privilege, and political activity personally and, hopefully, very unselfishly. Mr. Johnson has presented information in a way that has certainly changed my personal perspective and understanding from a political stance. What most do not know, is that the Declaration of independence has written right in it "We hold these truths to be self-evident, that all men are created equal, that they are endowed by their Creator with certain unalienable Rights, that among these are Life, Liberty and the pursuit of Happiness". Keith W, Johnson shows in this book how Christians can not only preserve, but use Gods gifts in political activity. From todays issues on health care to morality, this book covers it all. For anyone who is thinking of getting more involved, I would say this is a good read.